The crew of the shuttle Discovery, awakened by actor William Shatner reading a "Star Trek" tribute marking the veteran spaceplane's final voyage, geared up to undock from the International Space Station Monday to close out an extended assembly and resupply mission, the shuttle's 13th and last visit. With pilot Eric Boe at the controls, Discovery was scheduled to undock from the station's forward port at 7 a.m. EST (GMT-5). Backing away to a point about 400 feet directly in front of the lab complex, Boe planned to kick off a 360-degree fly-around, looping up over, behind and below the lab to capture photographs and video showing a final U.S. module in place, along with a full complement of visiting spacecraft from Europe, Japan and Russia. Boe and his crewmates -- commander Steven Lindsey, Nicole Stott, Michael Barratt and spacewalkers Stephen Bowen and Alvin Drew -- got in the proper spirit for undocking with a 3:23 a.m. wakeup song from Houston that was voted the second most popular in a NASA contest: the Alexander Courage theme from the 1960s television series "Star Trek." Boe plans to fly Discovery through a full loop, returning to a point directly in front of the space station before a rocket firing to leave the area for good. 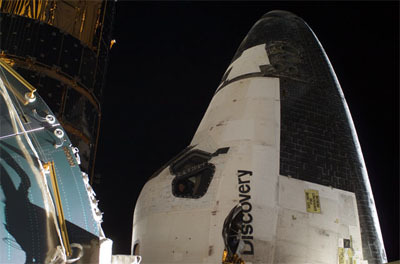 The rest of the crew's day will be devoted to carrying out a final inspection of the shuttle's reinforced carbon carbon nose cap and wing leading edge panels to look for any signs of impact damage from micrometeoroids or orbital debris since a similar inspection the day after launch.